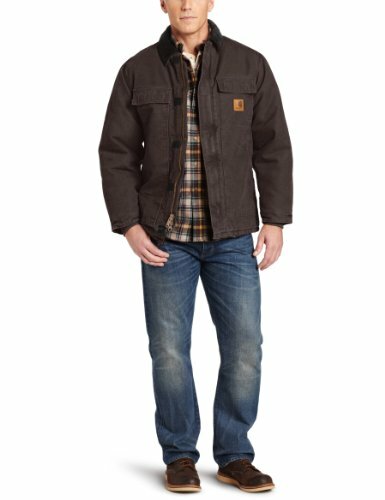 Carhartt Men's Arctic Quilt Lined Sandstone Traditional Coat C26,Dark Brown,Large | What Should I Say? Cold weather is no match for carhartt's sandstone traditional coat with nylon lining quilted to arctic-weight polyester insulation. Constructed of heavyweight 12-ounce, 100 percent cotton sandstone duck, it features rib-knit storm cuffs as well as a corduroy collar with under-collar snaps to accommodate an optional hood. There are two inside pockets, two flapped chest pockets, and two, front hand-warmer pockets. The split-back with bi-swing design plus pleated elbows make for ease of movement on the job.